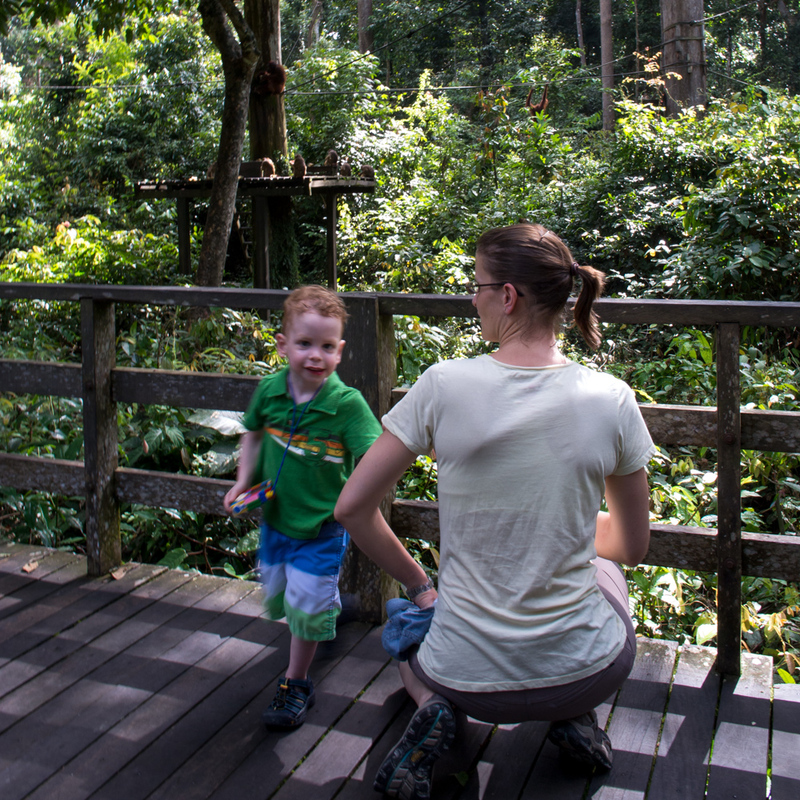 The afternoon feeding at Sepilok Orangutan Rehabilitation Center is definitely the better time to visit. We arrived at 3 pm and there was already a young Orangutan there, waiting for the park rangers to bring lunch. Then two females arrived, each with a baby clinging to its chest. They ate bananas, what looked like small oranges, and other fruit. One female, had an orange in her mouth, a banana grasped in one foot and some other fruit in her other foot as she climbed along a rope on her way out of the feeding area. After about 15 minutes, a female with her baby came down to the platform’s railing and climbed along it until she was right in front of us. The baby looked at us with its big gorgeous eyes before nestling it’s head in mamma’s shoulder. The small crowd of people let out a collective sigh. After she left, the platform was empty so we made our way along the exit boardwalk only to find another Orangutan sitting on the railing there. We were one of the first to arrive so we got another close encounter with this mom and baby for about five minutes before she climbed her way back though the trees and disappeared in the blink of an eye. For something so large, hairy and red, they know how to hide themselves quickly in the deep green jungle when they want to. A family of macaques barred our way so we had to wait for the ranger to come and shoo them away before we could pass. We still got within arms length of one sitting on the railing, it’s eyes darting from one person to the next, perhaps looking for a stray water bottle or packet of cookies to nab. The ranger spotted three red leaf monkeys in the trees a few steps later. The small, very red and long-tailed monkeys are a rare find, we were told, and we could see why. They are very slender so they are hard to spot as they hug the trees, high up in the leaves. Just as we reached the end of the exit platform, a single Orangutan came swinging through the canopy and came to rest in the top branches of a delicate and leafy tree right beside the parking lot. A crowd of us watched it for a while and then a female with her baby joined it. By the time we left at 4 pm, when the park was about to close, the three of them were still there, enjoying the shade and the cool breeze. It made it very hard to say goodbye.